Tampa Goes Broadway! WONDERLAND: A New Alice. A New Musical Adventure. Will open on Broadway!! Hello guys.. Julian back here with more updates around Tampa Bay and the David A. Straz, Jr. Center for the Performing Arts! WONDERLAND: A New Alice. A New Musical Adventure will open on Broadway at the Marquis Theatre on Sunday, April 17, 2011 and performances will begin Monday, March 21. The musical will be directed by Gregory Boyd, the artistic director of the Alley Theatre in Houston, Texas, with a book by Gregory Boyd and Jack Murphy (The Civil War –Tony nomination) and lyrics by Jack Murphy, music by Frank Wildhorn (Jekyll & Hyde – Grammy nomination, The Scarlet Pimpernel, The Civil War – Tony nomination, Dracula, Victor/Victoria) and choreography by Marguerite Derricks (Fame, Emmy Awards for “3rd Rock From The Sun” and “Fame LA”). WONDERLAND: A New Alice. A New Musical Adventure will play a pre-Broadway engagement at the Ferguson Hall at the David A. Straz, Jr. Center for the Performing Arts (Judy Lisi, President and CEO) in Tampa, Florida January 4 through January 16, 2011. 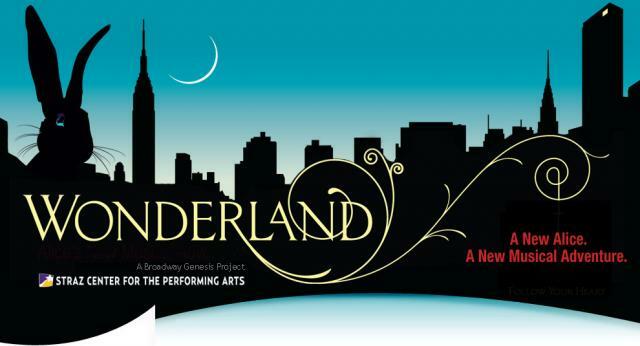 WONDERLAND is the first production of the Broadway Genesis Project, an initiative by the Straz Center for the Performing Arts to develop and prepare new musical theater for Broadway. From a show’s inception to final staging, the Project provides a safe and nourishing environment in a state-of-the-art complex with artistic, technical and administrative resources. WONDERLAND was optioned by Judy Lisi, CEO of the Straz Center, and was subsequently produced as its world premiere at the David A. Straz, Jr. Center for the Performing Arts in Tampa, FL this past December. In association with the Alley Theatre in Houston, TX, in January of 2010, the show was transferred for further development, becoming one of the highest grossing shows in that theater’s history. In this new musical featuring a new score, WONDERLAND is a story about a new Alice who has lost her joy in life. Estranged from her husband, alienated from her daughter and in danger of losing her career, Alice finds herself in Wonderland where she encounters strange though familiar characters that help her rediscover the wonder in her life. WONDERLAND will be produced on Broadway by the David A. Straz, Jr. Center for the Performing Arts (Judy Lisi, President and CEO), William Franzblau and Nederlander Presentations, Inc. The cast, design team and Broadway ticket information will be announced soon. Tickets for WONDERLAND: A New Alice. A New Musical Adventure may be purchased by calling 813.229.STAR (7827) or 800.955.1045 outside Tampa Bay, in person at the Straz Center Ticket Office or online at www.strazcenter.org. For more information about the David A. Straz, Jr. Center for the Performing Arts and its upcoming events, please also visit www.strazcenter.org. The WONDERLAND Concept CD is available through ITUNES from SONY Masterworks. There you go...! Buy some tickets for the Tampa shows or even consider a trip up to NYC! In the meanwhile, I&apos;ll make sure you stay up to date with everything that&apos;s happening here in Tampa Bay including exciting Tampa Bay area events!